Of his last 10 starts with the Oilers, new Predators goalie Devan Dubynk (.894 seasonal save percentage) surrendered three or less goals six times. In one sense, the Predators’ Wednesday acquisition of veteran goalie Devan Dubnyk (Oilers) acknowledged that Nashville’s current duo was not a permanent solution to the absence of Pekka Rinne. For nearly three months, the Predators have played without one of a franchise pillar in Rinne, whose hip infection was surgically repaired last spring. While Rinne is improving, the Predators still don’t have a timetable for his return and, as a result, have gone to Plan B without him. At the same time, the team has not given up on the playoffs. After Tuesday’s 4-2 win over Calgary, Nashville remains eight points behind Minnesota for the eighth and final playoff spot in the Western Conference. The Predators hold a game in hand on the Wild, which if they can win that game, would put them a manageable six points out with more than 30 games remaining. In some ways, the move is a testament to Predators management thinking their on-ice product has the capacity to make the playoffs — maybe seven victories better — if the club had better goaltending. This is not the fault of Carter Hutton, who was signed to be a back-p and play about 20 games, or rookie Marek Mazanec, who recently assumed the No. 1 role. The Predators believe Mazanec might have the athletic ability to be a very good goalie, but the Czech native is only a 22-year-old rookie and not yet ready for the rigors of being a No. 1 in the NHL. That’s far more pressure than merely learning the ropes as a backup. Coming from Edmonton, Dubnyk has fallen victim to playing for one of the NHL’s worst defensive teams over the past few seasons. The 27-year-old former first-round pick is 6-foot-6 — similar to that of Rinne (6-5) and former Nashville backup Anders Lindback (6-6). Hutton is listed at 6-1 but plays smaller, a bit hunched in the goal. Coach Barry Trotz’s frustration with the situation seemed to have boiled over on Jan. 5 when he criticized Hutton following a 2-1 loss at Carolina. Giving up two goals for a goalie is usually not a major sin; but with the offensively challenged Predators built on the premise of superb defense and strong goaltending, giving up bad, untimely goals is not part of the formula. Last season, Dubynk posted a very respectable .920 save percentage for the Oilers and owns a career save percentage of .910. If he can maintain that .910 standard — and perhaps inch his way to .920 — the way the Predators have played lately, they might have a much better shot at the postseason. At .901, the Predators’ save percentage ranks among the worst in the NHL this season — with only Calgary, the New York Islanders and Edmonton faring worse. The Predators have held together despite the difficulties associated with inconsistent goaltending, having earned points in seven of their last nine games. Dubnyk also comes cheaply, as Edmonton assumed half of his salary. Nashville will pay him only $1.75 million. 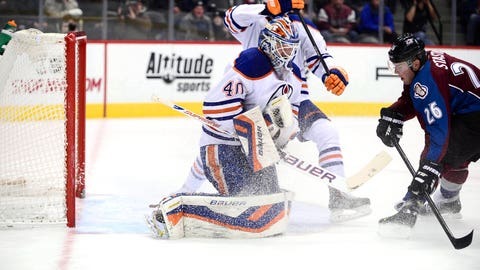 The Oilers, having signed Ilya Bryzgalov and now having traded for Ben Scrivens from Los Angeles, were eager to part with the pending free agent. To get Dubnyk, the Predators dealt gritty wing Matt Hendricks, who was unhappy with his role. The club also wipes out three more years at $1.85 million apiece, owed to Hendricks. It should also open up lineup space on a more regular basis for Rich Clune and could, on the whole, help to make for better chemistry in the locker room. It is by no means a panacea. More moves could be on the way, particularly to provide scoring. But it could represent a better opportunity in the second half.